Advanced Nanomaterials and Coatings by Thermal Spray focuses on the design, preparation, characterization and application of advanced coating materials for promising industries via thermal spray. 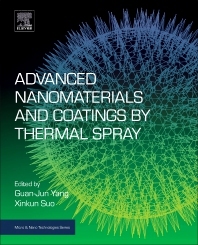 Chapters introduce the potential applications of advanced nanocoating materials, the unique characteristics of thermal sprayed nanocoating, the design and processing of nanopowders, and discuss various nanocoating materials and their microstructure/properties. In addition, nanomaterials with unique characteristics are presented, i.e., the dendrite or feather-like nanomaterials by suspension spray or plasma spray-physical vapor deposition hybrid technology. This book will serve as an excellent resource for both researchers and individuals in industry. Guan-Jun Yang, Ph.D. is a professor at the State Key Laboratory for Mechanical Behavior of Materials and the Director of the Center for Thermal Spray and Hybrid Materials at Xi`an Jiaotong University in Xi`an China. Dr. Yang’s research interests include coating/thin film technologies for wear or corrosion resistance, thermal insulation, photocatalyst, solar cells and fuel cells. Dr. Yang has co-authored over 150 peer-reviewed journal papers and holds over 20 patents. Professor Xinkun Suo currently serves as an Associate Professor with the Chinese Academy of Science, Ningbo Institute of Industrial Technology. He teaches on the topic of thermal spray technology. His research topic areas are thermal spraying, cold spraying, functional coating, composite materials, as well as surface modification technology, CFD modeling, and FEA modeling. He published over 25 papers on these topics.